20d. A New National Capital: Washington, D.C. This image, View of the Capitol at Washington by William H. Bartlett, was engraved by Joseph C. Bently in 1837. 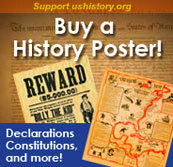 The Louisiana Purchase and rapid western expansion were crucial developments during the early republic. But attention there can misleadingly suggest that the United States rapidly assumed the shape we know today. Focusing on how the capital city of the federal government changed in the early years of the nation reminds us of the limited nature of the early central government. Like so many other elements of the new nation, even the most basic features of the capital city were unsettled. President Washington first took office in New York City, but, when reelected in 1792, the capital had already moved to Philadelphia where it would remain for a decade. Fittingly, Jefferson was the first president to be inaugurated in the new and lasting capital of Washington, D.C. in March 1801. The site of the new capital was the product of political compromise. As part of the struggle over Hamilton's financial policy, Congress supported the Bank of the United States which would be headquartered in Philadelphia. In exchange the special District of Columbia, to be under Congressional control, would be built on the Potomac River. The compromise represented a symbolic politics of the very highest order. While Hamilton's policies encouraged the consolidation of economic power in the hands of bankers, financiers, and merchants who predominated in the urban northeast, the political capital was to be in a more southerly and agricultural region apart from those economic elites. 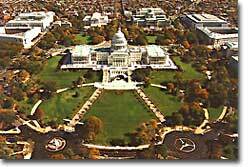 A dramatic aerial view of the U.S. Capitol and its surroundings in modern-day Washington, D.C.
Once the site for the new capital was selected in 1790, President Washington retained Pierre Charles L'Enfant, a French engineer and former officer in the Continental Army, to design and lay out the new capital city. His grand plan gave pride of place to the capitol building which would stand on a hill overlooking the flatlands around the Potomac. A long open mall connected the legislative building to the river and was to be bordered by varied stately buildings. Radiating out from the capital were a number of broad avenues one of which would connect with the president's house. Much of L'Enfant's grand vision was ignored during the nineteenth century, but starting in 1901 the plan was vigorously reborn. Today, Washington, D.C., is an impressive capital city that physically expresses many central values of the modern United States. It gloriously honors the nation's commitment to democracy and political life in impressive government buildings. The capital also maintains the nation's historical memory in monuments along the mall that commemorate key events and people. Finally, the city also announces the nation's commitment to knowledge and human achievement in the spectacular Smithsonian museums. At the same time the capital also symbolizes less celebrated aspects of modern America. Washington, D.C.'s impressive center around the mall is surrounded by urban poverty, a crisis facing most large American cities. The gulf separating American success and failure is on display nowhere more sharply. This drawing, published in 1805, is considered the earliest picture of what became the White House in Washington D.C. The most distant building, in the left center, was where John Adams lived during his presidency. Today's Washington, D.C., however, is a far cry from the humble place that Jefferson entered in 1801. Then just beginning to emerge from a swampy location along the Potomac, the city claimed only 5,000 inhabitants, many of them temporary residents to serve the incoming politicians. The Senate building had been completed, but the building for the House of Representatives was still incomplete as was the president's house. Jefferson took office while living in a boardinghouse! The limited physical stature of the capital city matched the modest scope of the federal government in the early republic which only included 130 officials. In fact, with the exception of the postal service, the national government provided almost no services that reached ordinary people in their everyday lives. For most people in the early republic the most meaningful political decisions were made at the state and local level. The National Park Service gives a brief summary on the history of the White House at this tourist-oriented site. The Independence Hall Association in Philadelphia offers a quality education on American history at this comprehensive site. Take a virtual tour of 'America's Most Historic Mile' in Philadelphia (the U.S. capital from 1790-1800), and visit battle sites of the Revolutionary War. Every president since Theodore Roosevelt has visited the National Cathedral, first conceived of by Pierre L'Enfant, who envisioned "a church for national purposes." The highlights here are the history and photo pages. Thunderation! I had my mouth set for bean soup! From now on, hot or cold, rain, snow or shine, I want it on the menu every day! -Joe Cannon, Speaker of the House in 1904, starting the custom that restaurants in the U.S. Capitol Building serve bean soup every day. Amid the sculptures of national figures in Washington D.C., Darth Vader has been found. The Old Hall of the House of Representatives, now Statuary Hall, has statues representing almost every state. See who was honored by your state. If you don't know who your representative in Congress is, find out here.